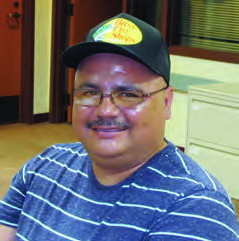 Many on campus know George Esquibel, 48, a popular volunteer tutor for both TRiO services and the YouthBuild program. But what some don’t know is that he’s legally blind and is pursuing associate degrees in both Human Services and Business Administration. Esquibel loves his studies at the college. But he said it would never have been possible without the encouragement of his family, as well as all of the support that he receives from SFCC’s Disability Services. Esquibel had a good paying job at UPS in 2012 when at age 44 he lost his central vision as a result of Stargardt Disease, a type of macular degeneration. “I knew I wanted an education so I could find a way to serve my community. I have a saying, ‘My setback is simply a setup for me to come back strong. That’s the power of optimism.” “The first step was probably the hardest – that’s asking for help. So I like to share my story because so many others could benefit from Disability Services,” Esquibel said. – Access to a CCTV/video magnifier – materials can be placed under the camera and an enlarged text image is displayed on the monitor. The user can adjust the zoom as well as other features such as change colors to highlight text or bring out the background. The technology is essential for him to take his exams. In addition to the CCTV magnifier, a reading appliance allows him to put any textbook under the camera and then, through digital technology, that page can then be read aloud to him. Like many incoming students he said he first “feared math.” But with hard work, he’s not only conquered his fear but also has been able to tutor others. “I love school and can now say I love math. I tell other students, ‘If I can do this, I know you can, too.’” Disability Services offers a variety of resources and adaptive technology.